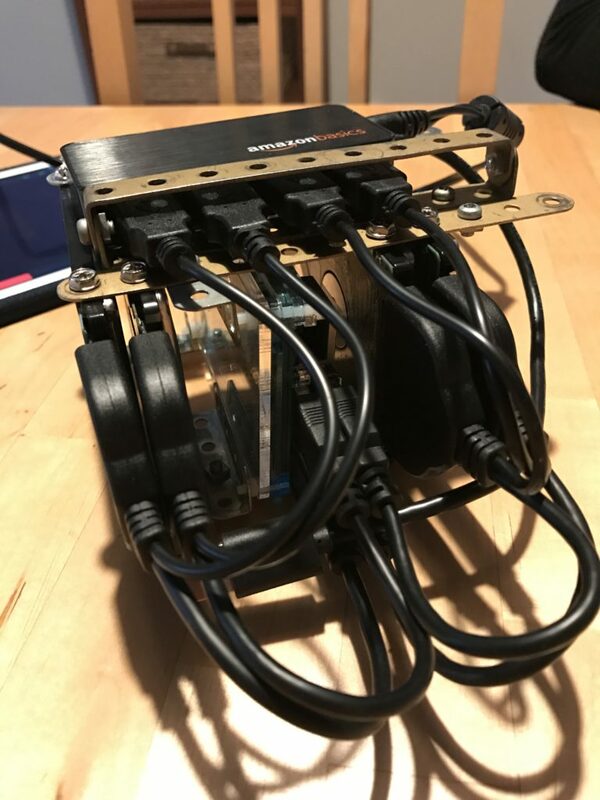 The first explains how to build a farming node with a Raspberry PI and the second how to monitor your node with Grafana. What I learned from monitoring? 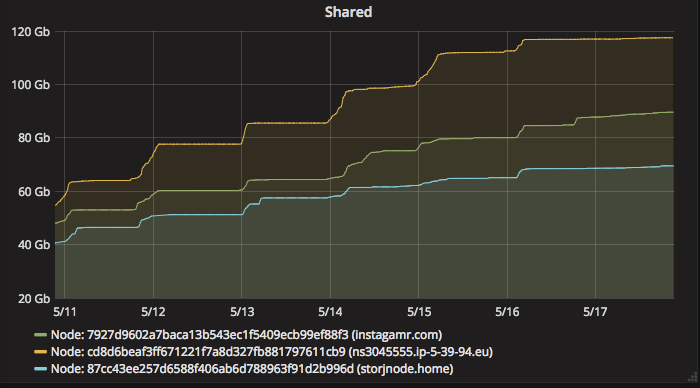 I’m now monitoring my nodes for a few days and noticed some interesting patterns that worth be mentioned. That is very uncool because, when Storjshare daemon crashes, you potentially loose the current contract and the corresponding data. Loose of contracts means less data, which obviously means, less money! How to optimize your Raspberry PI for Storj farming? I presume that you have a Raspberry PI 3, setup with Raspbian Jessie lite (without User Interface). If you don’t, you likely won’t have enough power to host an efficient Storj farming node. To setup Raspbian lite, please refer to the official doc here. So what now? Is there a way to optimize the Raspberry PI to efficiently farm with Storj? The good news is, you can customize a few things in the RPI « BIOS ». The closest thing to a traditional BIOS for the Raspberry PI can be found in /boot/config.txt. In that file, you can tweak a lot of parameters, all described here. The most interesting parameter is gpu_mem=16. It reduces to a minimum the amount of RAM dedicated to your the RPI GPU which in turns, frees some usefull megabytes for your storjshare-daemon. Removing Wifi and BT should reduce consumption a little and also deactivate associated services. Do not forget to reboot your Raspberry PI to see the changes take effect. Of course, do not install anything else on your Raspberry PI that consume RAM or CPU. Finally, if you have setup a monitoring solution as I mentionned in one of my previous articles, please be aware that sending metrics with collectd too often is very inefficient and consume a lot of CPU/RAM. You should send metrics at most each 2 minutes in my opinion. With this config, your farming node should be a lot more stable and efficient. At least, it’s what happened to mine! Publié le 17 mai 2017 28 février 2018 Auteur Olivier BalaisCatégories Raspberry PI, StorjMots-clés blockchain, farming, mining, storj, storj.ioLaisser un commentaire sur How Storj farming monitoring made me optimize my RPI3 setup? A couple of weeks ago, I put online three Storj farming nodes. Two of them are hosted on my OVH dedicated servers and I even built my own node with Meccano, a Raspberry PI and four old used hard drives. After putting them online, I found myself connecting every day on those three different machines to run storjshare status, htop, iotop and even ifconfig to gather metrics and understand how my nodes were behaving. While this could be OK at first, this doesn’t seem to be a good solution in the long run. 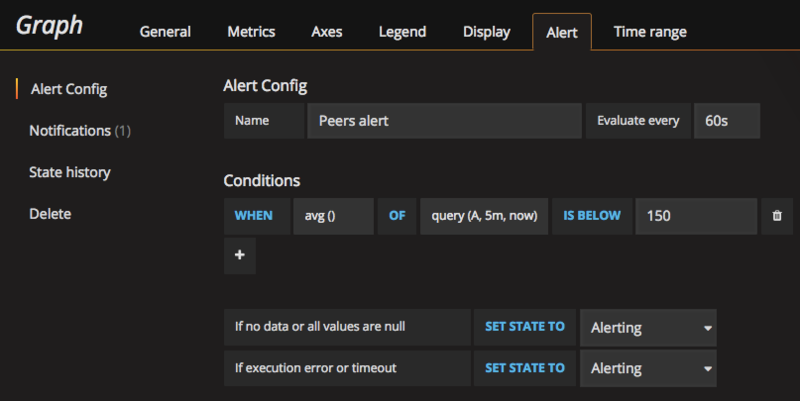 Monitoring your nodes and their host is really important to help you understand how they perform, how to improve their efficiency over time and of course, being alerted if something goes wrong. As you know, the more your node is online, the more data it will collect. 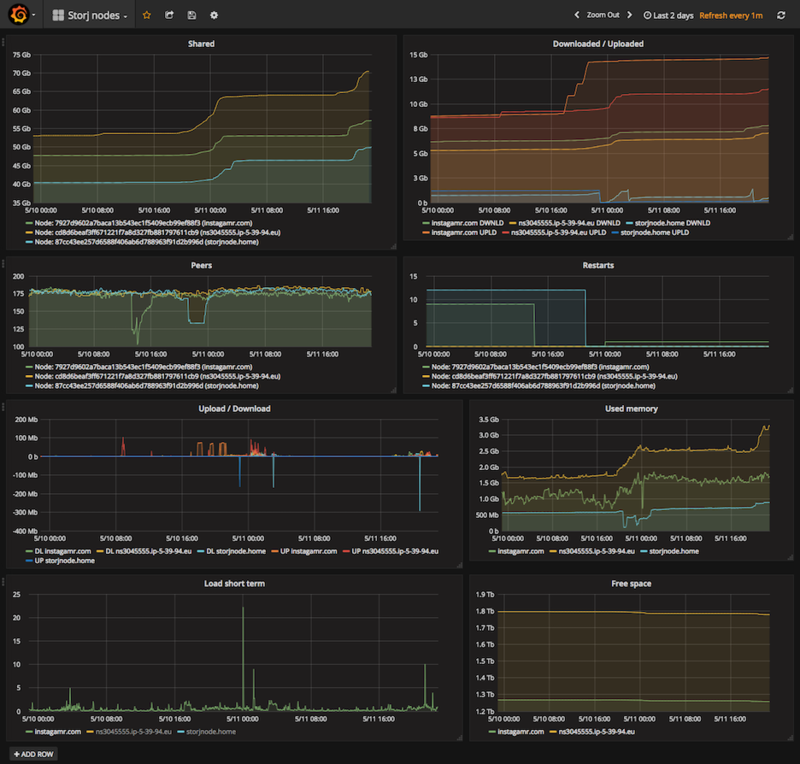 To simplify the monitoring process, I setup a very classic combination of Grafana, influxdb and collectd. Feel free to replace each one of these components by one of their many alternatives, according to your likings. Have a look at Telegraf for example to replace Collectd. Repeat the operation on every node’s host. See documentation for more informations on the setup process. Now that everything is setup, collectd should already be sending metrics to your influx datastore and you should be ready to create your very own dashboard on Grafana. And below a few queries I used to build it. Since a couple of months, a project grabs all of my attention. That’s Storj.io. If you never heard about it yet, Storj presents itself as a decentralized and encrypted cloud storage system based on blockchain technologies. The press, always optimistic, even names it the Airbnb of cloud storage. What is it, really? Storj is a network built on top of the equally named protocol, which aims to share extra disk space of individuals all around the world in order to provide a cloud storage system, cheaper and more resilient than Amazon S3 or Google Cloud Storage. Of course, in exchange of its extra disk space shared accross the Storj network, the user (farmer) earns a couple of bucks each month, depending on the amount of megabytes stored on its disks and the amount of data downloaded and uploaded during the same period. The vision of Storj is fascinating to me. The developers chose and implemented blockchain technologies at the very heart of the solution, which ease the de-centralization, allow faster data distribution, more resilient network, prevent security issues by encrypting everything and therefore, bring a lot of new features and opportunities to the end users. Make use of extra disk space of individual could seem a bit surprising first but did you know that most of the personal computers hard drives are just partly used, leaving as much as one trillion gigabytes of space when the entirety of Google is estimated to be 10 to 15 billion gigabytes?! Did you know that a gigantic part of the data a French individual owns is actually stored and retrieved from Ireland (Amazon) or even from US? To store that amount of data, big companies like Google, Amazon, Facebook or Microsoft build massive datacenters absorbing gigawatts of power. And of course, when one of those fail, Internet goes down. I think what Storj is building is quite similar to what is happening in power production and distribution. With the smart grid concept, we will progressively migrate from a centralized model, which cause around 10 percent of power production loss in transport in France, to a more efficient distributed model. If you want to learn more about Storj vision, please read the Storj Master Plan. It’s a bit old but still seems quite accurate. 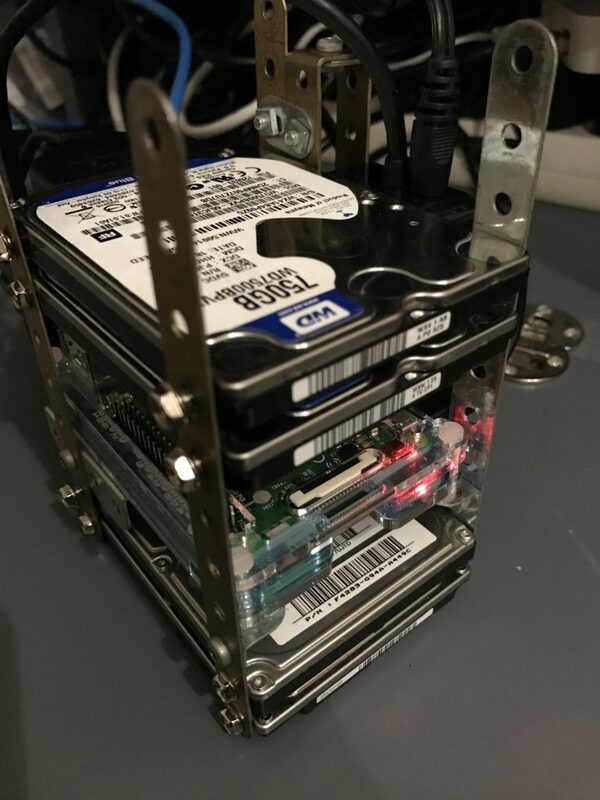 Well, it’s now time to build your own Storj node to share your hard drive and earn a bit of money! In fact, it may be just the right time because StorjLabs company is bout to reveal a partership which should cause a big increase in storage demand! 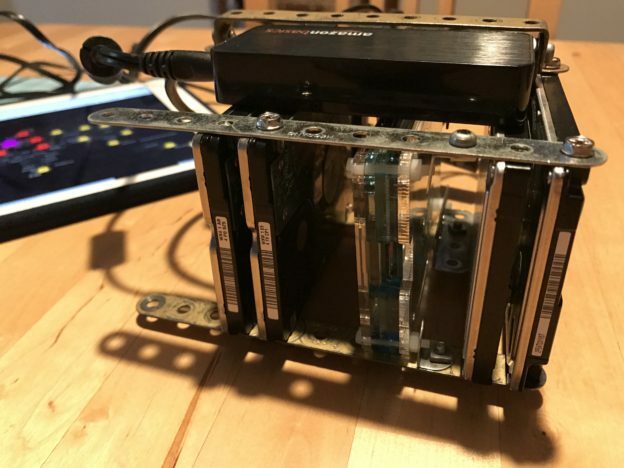 So, what do you need to build your own Storj.io farming node? In fact, not much, just a computer with unused disk space. But if you want to build a cost efficient solution, always up and running, using something like a Raspberry PI may be a better idea than leaving your Macbook always turned on! Meccano parts from my Dad’s childhood! As you can see on the pictures below, the USB hub powers the four hard drives. I used another power supply connected to the Raspberry PI because all USB ports are currently used. But, I think that, with a larger USB hub, I could have powered the RPI directly from it. As you can see on the last line of my fstab, I make use of mergerfs to merge all of my hard drives in a single volume, mounted in /mnt/storjmerge. It’s mostly because Raspberry PI 3 has not enough RAM to run efficiently more than 1 node at once (1GB of RAM seems barely enough while receiving big uploads from peers). First of all, let me confess, the title is a bit sensationalist. A REST API? Yeah that’s quite exaggerated. But yes, I now can send a PUT request to a super mega secret URL from my smartphone and see my building garage door opening almost magically. Still quite cool, uh? Those who know me could say how much I love those powerful tiny and yet affordable computers that are Raspberry PI. You didn’t buy one already? Go for it now! Seriously. You don’t know what to do with it? No worries, you can do anything. And if you don’t know yet what to do, that’s the awesome part, you will find something to justify your purchase. The only limit is your imagination and it shouldn’t be limited too much. Now that we know the constraints, let’s build our solution. I am a web developer, this part has been the most difficult for me. But also maybe the funniest. As I said before, I can’t make any modification to the existing garage door hardware. The solution I chose was to use one of the remote control I already had to open the garage door, associated to a pair of the Raspberry PI’s GPIO pins to send the correct radio signal which will open the door. If you don’t know what GPIO are, it stands for General Purpose Input/Output. 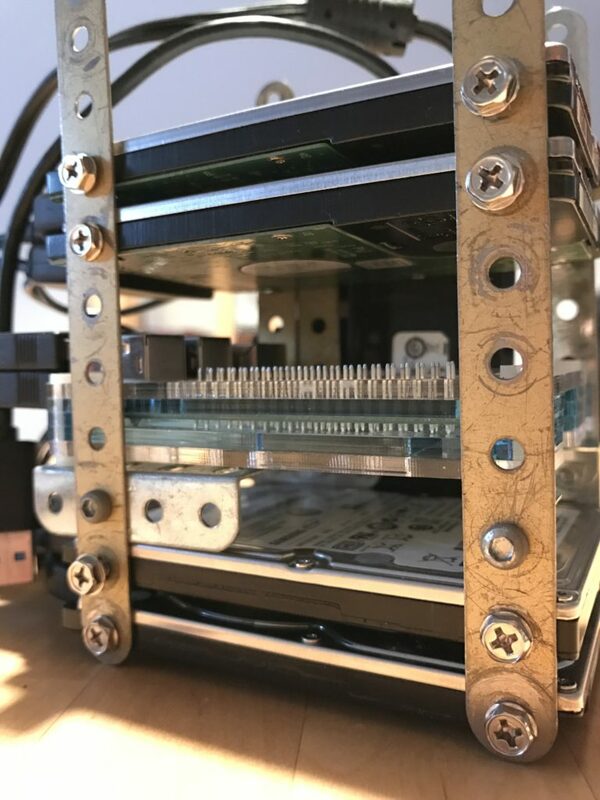 One powerful feature of the Raspberry Pi is the row of GPIO (general purpose input/output) pins along the edge of the board, next to the yellow video out socket. These pins are a physical interface between the Pi and the outside world. At the simplest level, you can think of them as switches that you can turn on or off (input) or that the Pi can turn on or off (output). Seventeen of the 26 pins are GPIO pins; the others are power or ground pins. What are they for? What can I do with them? You can program the pins to interact in amazing ways with the real world. Inputs don’t have to come from a physical switch; it could be input from a sensor or a signal from another computer or device, for example. The output can also do anything, from turning on an LED to sending a signal or data to another device. If the Raspberry Pi is on a network, you can control devices that are attached to it from anywhere** and those devices can send data back. 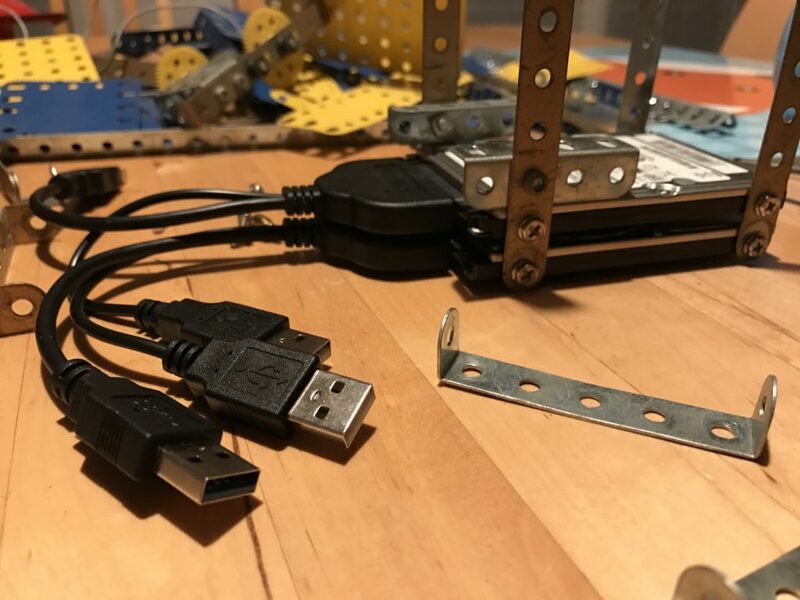 Connectivity and control of physical devices over the internet is a powerful and exciting thing, and the Raspberry Pi is ideal for this. Lucky me! First, the remote is powered by a 3V battery which should be easy to replace directly by the Raspberry. Secondly, the printed circuit board and mostly the button part which opens the door seem simple enough to suit my needs in customization. After a few tries, I found the two weld points I needed to connect in order to simulate a constant push on the opening button. You can see me connecting them in the photo above. Then I used a few tweaks to replace the battery and use the RPI’s GPIOs as an “on demand” power supply. As you can see, I used the first available 3V programmable output (pin #11) + the ground. That’s it. 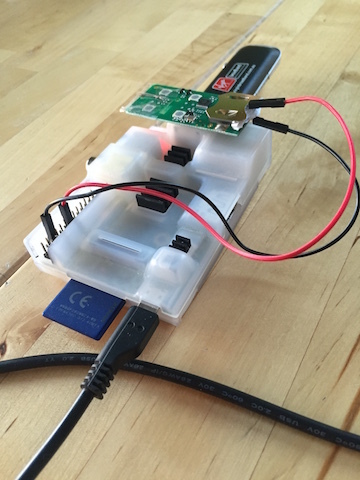 Now that the Raspberry PI is connected and ready to power up the remote, we need to control the GPIOs and see if everything is working as expected. Again, there are multiple viable solutions to control your GPIO. One of the easiest is to install a utility named wiringPi (http://wiringpi.com) which allows you to read from and write values to the GPIOs, directly from your shell. Just try the command gpio readall to see if the setup gone well. If so, you should see a mapping table displaying port by port the current mode (input or output) and the value associated. Yay! The remote led is blinking which means that from my laptop, via an ssh connection, I can now execute a shell command that sends a radio signal to open my building garage door on demand. Now that we can send a radio signal from the PI to open the garage door, we need to create some API endpoint to send that very same radio signal with an HTTP request. This part is from far the simplest. I used Silex PHP micro-framework and 5mns later everything was working. Of course, you should use whatever language or framework you’re comfortable with as long as you can execute shell commands from your program. OK so, we have a basic API that allows us to control our door remote. Now is the time to make this API accessible through internet. As I said earlier, no trusted wifi is accessible from my garage. No worries, a 3g stick connected to the PI should do the trick. I used a Huawei e169 well known for its compatibility with Raspbian and the PI. You can find one of those on Amazon for around €30. To create the connection using GRPS/3G, you have, once again, multiple choices available. I chose to configure manually a new interface using ppp protocol. I named my provider sfr because, guess what, I used a SFR sim card. Feel free to name it to whatever provider you wanna use. connect "/usr/sbin/chat -v -f /etc/chatscripts/gprs -T websfr"
You may need to adapt this configuration to your own setup if you use a different provider. At this point, you should have a 3g interface named ppp1 that you can up or down using ifup or ifdown commands. You might already know that mobile providers make use of CGN/LSN approach to optimize IPV4 distribution. If you don’t, think of it as a NAT at large scale. Private IPs are allocated to customers and a network address translator maps multiple private IPs to one public IP. This technique is essentially used by internet providers to mitigate the IPv4 addresses exhaustion. Like any form of NAT, it breaks the end-to-end principle and so, prevent us to use the public IP associated to our 3g stick to connect directly on our Raspberry, neither access the garage door API. The once will not hurt, there are many ways to fix that issue all based around the same principle: SSH tunneling. Here, I used a combination of ssh tunneling + remote port forwarding and a reverse HTTP proxy on my OVH server to make the API hosted on the Pi accessible worldwide. You might also use something like ngrok (https://ngrok.com/) to ease the process if needed. This file allows me to use the following command ssh -T -fN api-tunnel to create a tunnel which forwards my API local port on the public remote server configured. To make it persistent and easily created at system startup, I used autossh command that you can add with a simple apt-get install autossh. Then, all you have to do is to setup a reverse proxy (choose haproxy, nginx, apache or whatever solution fits your needs and preferences) on your public server. 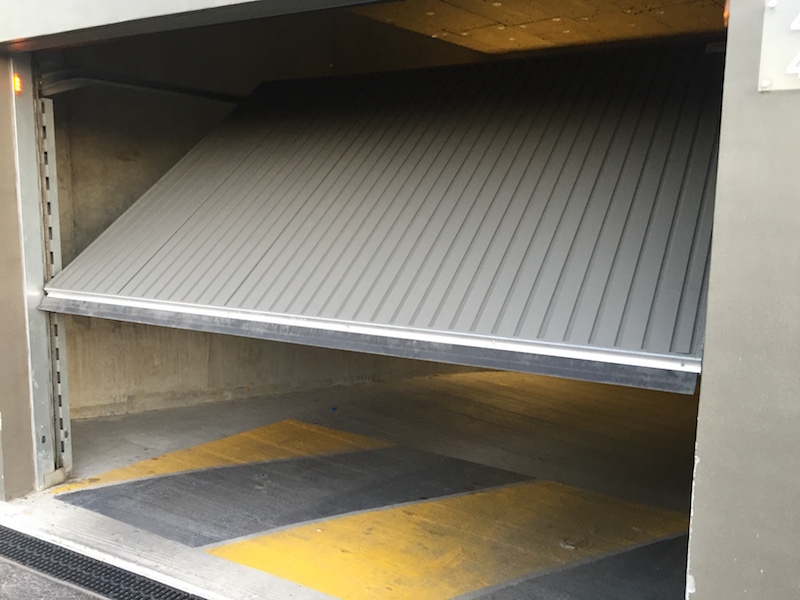 And, get to that step, we can place our prototype around the garage door and call our public endpoint with something like curl -X PUT my.awesome.garage.api/door and, finally, tremble with joy while seeing the door opening. The main disadvantage of the prototype I described here is the fact that your RPI needs a 3g stick and the associated subscription if your garage is not wired with RJ45 network and if you can’t access any trusted wifi from there. This subscription could represents a money problem even if French (in my case) mobile providers such as SFR, Free or most MVNO now come with data plans cheaper than ever. To fix that issue and build an even greater prototype, one of the first alternatives that comes to mind is a SMS based solution. 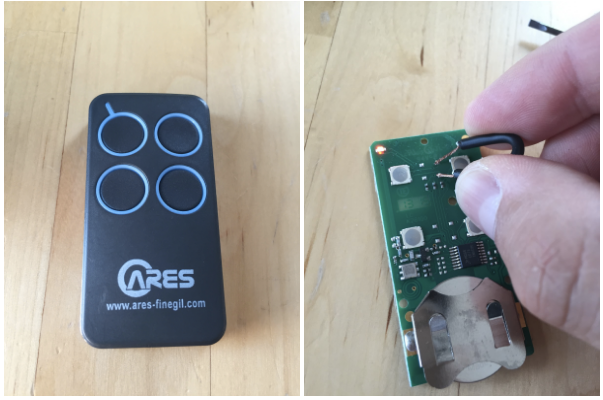 The idea is to command the garage door opening by sending a SMS directly to the Raspberry. This solution is quite cheaper of course because you only need a subscription to a mobile phone provider that allows you to receive SMS. But the really cool part of that alternative is that you could now ask Siri “Please, send a message to My Garage and say ‘open now’” and see the magic happen without the need of developing any web-based interface. And if you still really want something accessible through a REST API, an hybrid solution based on SMS to control the RPI + an API hosted on your own server should be a perfect alternative. When the API receives an HTTP request it then immediately sends a SMS to the PI via a “Twilio like” service for example. Still really cheap and embeddable in whatever app or service compatible with a REST API (IFTTT, Slack, you name it). Do I really need to open my garage door from Internet. Not so much actually. A few times a year, when my wife forget its own remote control or when my brother wants to park its moto inside my garage. But I had quite some fun building this prototype. And after telling some of my colleagues and friends about the project and see their enthusiasm, I’m sure there are a lot of use cases that could be implemented with this kind of solution. Maybe you got one?